Mega Magnus Target Site Listing Goes Up, Magnus to be Released in a Few Weeks? A Photo of the Magnus blaster already released in Hong Kong. Target.com has recently put up a web listing for the Mega Magnus blaster. For us USA people, that means that we should be getting this hopefully sooner then later. If you go to the web listing, there’s a “Find in a Store” option you can use to check Target stocks in your Zip Code. $14.99 is the online price for this blaster. The product description, found below, is pretty short and to the point. 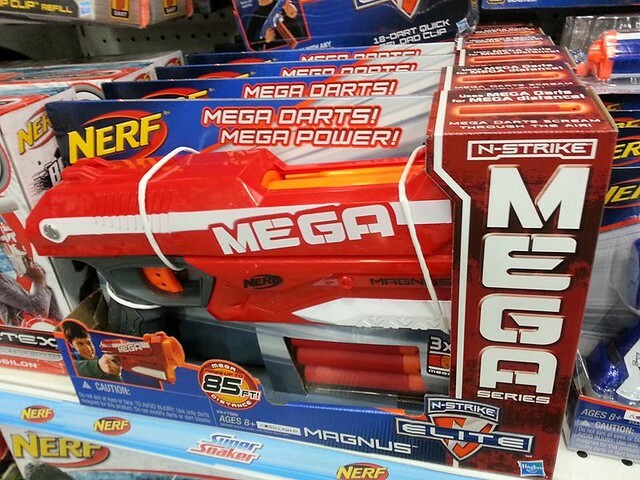 Make somebody mega happy by treating them to a Nerf N-Strike Elite Mega Magnus Blaster. This Nerf blaster shoots Mega darts up to 85 feet and can hold 3 darts at a time. It has a textured grip and a tactical rail on the bottom. A great gift, this cool new Nerf gun inspires kids to create exciting Nerf battles and games. Ages 8 and up. Stay tuned to Basic Nerf for more Mega Magnus information as it hits the internet. Great now even Nerf is calling them guns. Also at first it calls it the Magnus Blaster (it’s a blaster) and later refers to it as a Nerf gun. I think Nerf doesn’t make the descriptions, the store does. Hey! The Crossfire Bow and Sidestrike just popped up on there! Thanks for the heads up on that. I’ll be making a post about it soon. They were here in Erie, PA for about a week before they were all snatched up, none to be found in Wal-Marts or Target. None at the Targets in Chicago yet… No idea why, it’s a few days after Hasbro’s original date and the site says it’s not online or in stores.